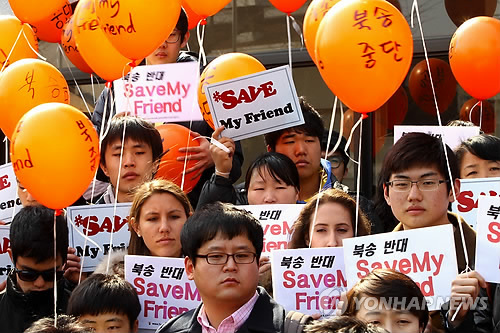 The number of North Korean defectors has recently risen to more than 12,000. Most of the defectors escape from North Korea into China due to its long-term dictatorship system and financial difficulties. However, more than 5,000 defectors are sent back home every year. Among those people, between 60 to 70 percent are women. Most likely, they are treated as outlaws and get tortured after being sent back to North Korea. Even though China expects them to be harshly treated they keep repatriating the defectors to North Korea. This has brought about human rights problems and became a world-wide issue. Opposing the way China deals with the defectors, a large number of protests are being held. People from all around the world are participating in protests and exchanging information through SNS such as Facebook and Twitter. Defectors who fail to escape North Korea are detained in Tumen camp before they get sent back home. At the camp, they receive subhuman treatment. They are given just one or two meals a day and are tortured terribly. China has faced raging criticism internationally. The main point from the people criticizing China is that China should admit that the defectors are refugees. Generally, ‘refugees’ refer to people who leave their own country to escape political persecution or war. A convention relating to the UN Status of Refugees also defines refugees as people who are concerned that they are being persecuted due to the matters of race and thought. In addition, according to the Convention against Torture and Other Cruel, Inhuman or Degrading Treatment or Punishment in International Legal Obligation, you must not banish refugees to the place where their lives and freedom can be threatened. It is obvious that deporting those defectors to North Korea can be akin to indirect murder. It is a well known secret that after they are forcibly returned to their own country they receive ruthless persecution such as torture and even are executed by a firing squad. Therefore, people insist that China should protect the defectors who have crossed over the Yalu River to China. On the contrary China argues that the defectors are not refugees. China regards the defectors as illegal immigrants because they say the defectors escaped from their country for economic reasons. The reason why China is stubborn on this matter is to prevent chaos between their boarders and Dongbei. Accepting defectors for human rights protections may also cause some difficulties on governing minority groups in China such as Tibetans. Furthermore, given the fact that China has been keeping a blood alliance with North Korea and it will also affect the alliance. China believes that if it admits the defectors as refugees, this may lead to a mass exodus and encourage the collapse in North Korea. The problem of sending back defectors has long existed. However, the Korean government has begun to change its submissive attitude on diplomatic matters and has brought up the problem internationally. Not only President Lee Myung-bak, but also many congressmen, celebrities and religion groups have also shown their dissenting opinions of China’s action on treating defectors. Subsequently, people from different countries and areas have begun to take part in protests, claiming that China should stop sending back those defectors forcibly. The ways of protesting vary from simple sign-in campaigns to fasting and candlelight vigils. According to Koo Yoo-hwan, professor in the Department of North Korean Studies, the government and citizens of South Korea should work together by distributing their roles to resolve this problem. Citizens should put their efforts on spreading this issue at the social movement level while the government works carefully on diplomatic relationships with thorough strategies. He also added that this issue is beyond ideology and system. It is important to prevent repatriating those defectors but it is also crucial not to block the existing passage for escaping.